I know, I know, just what you’re craving in the middle of summer…a dish that brings the heat! Did I nail it on the head or what? Well, maybe you can entertain this as an idea for a rainy, cool-ish summer evening. We enjoyed it on a night like that just recently! We’ve had a lot of rain and clouds around these parts. One day I just started throwing things into a pot and didn’t actually expect this recipe to be a winner, but it turned out to be really tasty, especially after a couple more trials. I love that it’s extremely fast to prep. My goal was 10 minutes prep, and I usually clock in at around 7 or 8 minutes (when I have my cooking game face on!). I also wanted the dish to rely on pantry ingredients, such as dried spices rather than fresh aromatics. Don’t get me wrong, fresh garlic, onion, ginger, chillis, etc. are typically my first choice, but they aren’t always practical for those rushed nights. Another benefit of this recipe is that you can use whatever veggies you have on hand, so it can work for all the seasons. I, Eric, and Arlo are really enjoying it…and I’ve even convinced Adriana to eat a bit (it was a sweet potato version, and I ended up mashing her sweet potatoes into the dal and stirring in the rice). This satisfying pantry dal is lightning fast and will only set you back around 8 minutes of prep time. While not an authentic dal, I created this version out of a desperate need to come up with more speedy pantry dinner options. You can change it up so many ways by simply varying the veggies you use, and in my tips I've provided an alternative spice option, too—I still can't decide which one I like better! Before you begin, I recommend setting out all the spices on the counter so they’re ready to go when you’re cooking. Also, if you have some on hand, this dish is great with baby spinach stirred in during the last couple minutes of cooking. In the photographed dish, I used 2 cups each of chopped zucchini and broccoli florets, but of course, feel free to use any veggies you prefer. In a large pot, melt the coconut oil over low-medium heat. Peel (if necessary) and dice the veggies into 1/2-inch pieces. Add them into the pot and stir until combined. Increase heat to medium. Add in the rest of the ingredients (lentils, water, diced tomatoes [with juices], coconut milk, all the spices, salt, and pepper). Stir until combined. If desired, serve over rice, and garnish with cilantro and lime (it’s still great without these additions, though!). Nutrition info does not include accompaniments, such as cooked grains. * You can use any veggies you like here! Whatever is lurking in your kitchen, feel free to try it out. A few ideas for combos include the following: carrot and zucchini, potato and peas, sweet potato and red pepper, broccoli and zucchini, cauliflower and/or broccoli. ** Minced (or flaked) onion is less concentrated than onion powder. Onion powder will work as a substitute if that's what you have on hand, but I would suggest starting with a small amount and adding it to taste in ¼-teaspoon increments to avoid it overpowering the dish. *** I use Simply Organic brand of curry powder. If you don’t have a favourite curry powder blend on hand, you can substitute the following: 1 1/2 teaspoons ground turmeric, 1 1/2 teaspoons ground coriander, 1 teaspoon ground cumin, 1/2 teaspoon ground ginger (or more to taste), and 1/4 teaspoon cayenne pepper (optional). Don’t forget to use the 1 1/2 teaspoons of both garlic powder and minced onion, as well. It feels like all I have time for these days are 10 minutes or less meals! This will definitely spruce up our weekday menu and luckily most of it I already have. Yum! Ugh, I know the struggle of a sudden picky eater and how it makes you defeated and uninterested in cooking! My son started this same phase around 2.5 years old. He turns 4 in the end of October, and it’s only gotten slightly better. I’ve been making smoothies with fruit and veggies and freezing them into popsicles, so when he claims he’s still hungry 2 seconds after dinner and only wants a popsicle, I at least know he’s getting some nutrition. Hang in there! I’ve learned to just cook for myself again, and figure my son will learn to eat what’s being offered. He seems to be getting better, but we still have nights where he claims he doesn’t want or like anything. This recipe looks delicious and super simple, a win-win! We’ve been getting rainy, cool evenings here too, so I will put this aside for the next one! Hey Stephanie, That’s a GENIUS tip about freezing smoothies into popsicles!!! I’m doing this today! Adriana was really into smoothies, then lately not as much, so I think this is a wonderful idea to try. It sounds like our kiddos went through this phase around the same age (she’ll be 3 at the end of Sept.). I hope you enjoy the recipe if you try it out! Yes! Again the same, my son also started claiming he doesn’t like smoothies suddenly around 3 years old… Another life saver for us has been these disposable ice pop molds. They have a ziploc closing on the top – I included a link below. I got them to make homemade go-gurt style yogurt, but he also claimed he didn’t like those. So, I blended yogurt with fruit and then froze them, with slightly better results! I’ve also used them for when he is sick, and fill them with vitamin water or similar (perfect for sore throat and fever when they don’t want to eat). this looks great, can’t wait to try it!! do you think this could be made in an instantpot? I found a recipe for split lentils and it calls for 8 minutes, high pressure, natural release. I was thinking I’d start there! And yes, Angela. Thanks so much for these quick, easy, and pantry-friendly recipes! REALLY appreciated! I am all for the quick dinners these days because I usually have a toddler hanging on to my legs crying while I’m trying to make it….and then he doesn’t want to eat it haha. I’m looking for more plant-based recipes too so this is perfect! Hey! This looks delicious. Would canned lentils work instead of the dry and forget adding water?? This is just what I was hoping to find here. I don’t have to make it to know I will love it and it is healthy! I don’t have babies but my life is really busy lately and there just isn’t time sometimes to cook healthy stuff. Very grateful. When you get a chance to give the recipe a try, I hope you enjoy it as much as we do, Janine! This looks absolutely delicious! Have you tried Penzey’s spices? It’s something I think you’d have to order, unless you were in Scottsdale, but so worth it. Their Curry Now is AMAZING. All their spices are delicious – nothing like store spices. If you haven’t been to one of their shops, add it to your to-do list the next time you’re in Arizona. I think you’ll really enjoy it. Hey Camille, I have been to one in Scottsdale and it was wonderful!! I don’t believe I have tried their Curry Now spice, but I’ll have to double check my loot to make sure I didn’t forget about anything. Yes! So many grey days lately, such a cool summer. 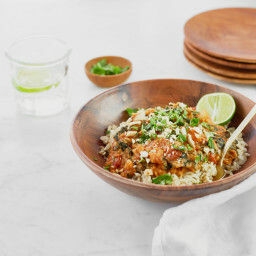 I love daal, I’ll have to give this a try! I am also in the stage of needing really quick dinners and this looks perfect! My little guy (9 months) will eat anything right now and I’m trying to appreciate it while it lasts because I know the toddler years can be so much trickier with that. Thanks for the recipe! Hey Carolyn, Oh that fake cough….I’m giggling. SO cute. How are they so smart this young?! I’m always amazed. Sounds like he has you figured out already. ;) Arlo likes to “blow bubbles” (or as Adriana likes to say, ARLO SPITTIN!” to get my attention. Question: (Maybe I missed this) If I do the carrot combo, how would you recommend chopping those? Small dice? Thanks! Hi Stephanie, I’d recommend chopping those at a 1/2-inch dice or so, so the recipes cooks as quickly as possible. If you try it out, I hope you and your family enjoy it! Oh – love the tip to set out all the spices first – I waste so much time going back to the cupboard when I don’t do that! And still forget to do it! Thanks heaps! Just tried it with corn (one leftover ear – kernels sliced off), zucchini, broccoli, and 2 cups of fresh spinach. Added the spinach in the last five minutes of cooking to just wilt it. Ran out of curry powder so added some curry paste. Love that this is so simple and easy to prepare. Holy cow! This recipe is the BOMB DOT COM! I cannot believe how easy and delicious it is. I will be sad when my leftovers are gone and will be looking forward, happily, to making it again SOON! YUM!!!!!!!!! Thanks for the love, Laura! Welcome back! Mushed/mixed daal and rice is one of the first foods kids in India ever eat, so you and Adriana are on to something there. Here’s hoping the latest phase wraps up soon. I’ll be making this soon with our latest CSA goodies! Quick meals are so helpful at busy times and on nights when it’s easy to snack too much out of hunger and impatience. Thanks, Kate! I hope you enjoy the recipe when you get a chance to make it. Happy cooking! This was delicious, one of the best, and easiest!, dal recipes I ever tried. I foresee many versions of this dish in my immediate future. I’m glad you enjoyed it, Marielle. This dish is just so versatile…have fun experimenting! Oh yum! I always am in the mood for Dal!! This recipe really hits the spot!!! Can’t wait to make it myself! I hope you enjoy it when you get a chance to give it a try, Liv! This might not seem like a great dish for summer – but it totally is!!! I just made it using a bunch of random CSA leftovers – corn, zucchini and spinach. Perfect and yummy!! I steamed some Trader Joe’s frozen rice and used squeeze lime juice for the ultimate lazy girls meal! Happy to hear you enjoyed it, Vanessa! Hey Daniella, Thanks so much for your support! I hope you’re enjoying the app so far. For most of my recipes I don’t calculate and share the nutritional information. 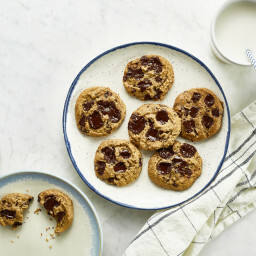 But, if you go to a free online tool like caloriecount.com or nutritiondata.com (or an app like MyFitnessPal) and plug in the info for the recipe you want to know more about, you should be able to get a nutritional breakdown fairly quickly. Hope this helps! Made this tonight and it was deelish and easy- did broccoli, zucchini and yellow pepper over brown rice that I got in the frozen section of Trader Joe’s. I’m glad the recipe was a hit, Terri! This was so yummy and no joke 8 minutes!! I will definitely keep this on rotation. First attempt was zucchini and frozen green peas. And I had some basmati rice I had frozen recently when I made a huge batch. My super picky toddler actually took four bites (In bargain for her bowl of cereal – sob). I think they all go through it. My friends pediatrician calls them “pastatarians” during this phase! Made me laugh out loud. But with a toddler and six week old I would love to see more “pantry” recipes like this! I have your app too but came over here to say that! Thanks for all your great recipes Angela! Oh my goodness, I just made this and it is amazing! I added a tiny dash of cinnamon and served it over basmati rice. Thanks for a great recipe! 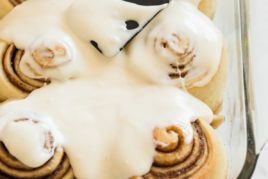 A dash of cinnamon–what a fun twist! I made this but substituted the coconut milk with soy/coconut milk but it messes it up , it become like soup hahaha, how can I fix that ? Hi Irma, Canned coconut milk–even the light kind this recipe calls for–tends to be thicker than a soy/coconut milk blend you’d find in the refrigerated section of your grocery store. That’s likely why you found the consistency of your dal too thin and soup-like, unfortunately. Your best bet next time would be to use canned light coconut milk. Another thing you could try is cooking the dal longer so some of the water cooks off and it thickens up. Hope that helps! Hey Beth, I’m not sure, to be honest! The coconut gives it a lightly sweet, creaminess that helps offset the acidic bite from the tomatoes. If you are omitting the coconut milk it would take some experimentation probably. I’m sure you could try using veggie broth (maybe reduce to 1 cup though), but you might want to try adding back some fat into the recipe as well, in another form (maybe a bit more oil?). Another reader asked if unsweetened/unflavoured coconut yogurt would work, so maybe you could try an unsweetened/unflavoured soy-based yogurt? Just throwing ideas out there! If you try anything please let us know how it goes! Just curious if I can use unflavoured/unsweetened coconut yogurt, only because it’s what I have on hand? Maybe thinned a little? Or would it be too much tang? WOW this looks absolutely mouth watering ! What a tasty twist on Pantry DAL! Excited to try this! The day you posted this, I was looking through OSG Everyday and thought to myself the green-orange creamsicle smoothie would make an awesome popsicle–so we made it (without the ice) and they were delicious. My 4 year old LOVES popsicles too, so get that spinach in there and I feel pretty good about it! Thanks so much for all your recipes!! Hey Jen, Oh, that’s so funny because I was JUST thinking about this exact recipe, and made a mental note that I should make it into popsicles! I’m so happy you enjoyed it! Adriana is now obsessed with the “smoothie” popsicles I’m making her (which also include greens…muhauhauh) and she thinks they are a “treat” which makes her want them even more. Anyway, I’m sure she will hate them in a few days so I better pack as many into her as I can, lol. This looks so yum!! I love how healthy it is and how easy and quick it is to make! I love healthy recipes and this one is definitely one that I have to try. Thank you so much for sharing it!! Love your blog! If you give it a try, I hope you love it as much as we do! I’m happy to hear you enjoyed the dal, Lea! That extra bit of of seasoning sounds like a great addition, too. Yum! This looks so good and so fast! I think I’m going to try doing it in the Instant Pot…I’m thinking it’ll only take about 5 mins of cooking time! I tried this in my Instant Pot tonight. I changed it up a bit after reading about conversions to pressure cooking – As vegetables can go to mush easily under pressure, I only used very hearty vegetables – carrots, broccoli stems, re-hydrated mushrooms and some frozen beet greens that were looking pretty sad (not that they are hearty, but I just wanted to get them used up). Would have added potatoes and cauliflower if I had them. I also omitted the tomatoes as I read that if adding an acid one should increase the cooking time by up to 4x. Had planned to add a fresh tomato after cooking but forgot. Had a sad onion so chopped that up and threw it in. Cooked everything on high pressure for 8 mins then did a natural release. Added some snow peas, mixed greens and minced fresh ginger after cooking to brighten it up a bit. I like most of my vegetables al dente, so the very light cooking they got by adding them in the end was perfect for me and gave everything some texture variance. Lol – sorry to have messed with your recipe so much, Angela, but thanks for the inspiration! Lol, no apologies necessary, Kat! I love to hear how my recipes have been adapted. It’s so inspiring to hear how others get creative in the kitchen! Made this for supper last night. Easy and delicious!! Will definitely make again. Thanks!! So glad you enjoyed it, Tammy! I love fast, easy and healthy dishes, Angela! Which gains would you recommend for serving? This is a great, simple recipe for using up random summer veggies – I often have a few lingering in the bin. Also, have you considered simplifying your weekly cooking? Three nights a week I cook the same thing (pasta on Monday and soup and grilled cheese on Tuesday, and one night a week is cold sandwiches with cut up fruit). As a FT outside the home working mom of 3 little ones – who were once 3 under 3 – I found this saved my sanity for a year period. Okay, I’m in a similar situation as you AGS with the 3 little kids including a newborn, and I do the same meal deal thing by doing repeats but I was not working full time!! I can’t imagine. But I like this recipe for using up the zucchini in my garden too, lots of veggies starting to come! Looks super delicious and easy, thanks for sharing!! Ok, this looks downright delicious! I have been on a HUGE Thai food experimentation phase and you can see evidence of it with recipes at www.behindtheplates.com but, I think Indian flavors need to be my next route….starting with this!!! Hope you love it, Missy!! More recipes like this please! Could you just use frozen veg? Then you would be done in like four minutes! I can’t see why not! If you have a frozen veggie mix that you love, I say go for it. :) You may benefit from adding them a bit later in the cooking process, too. Looks so delicious. 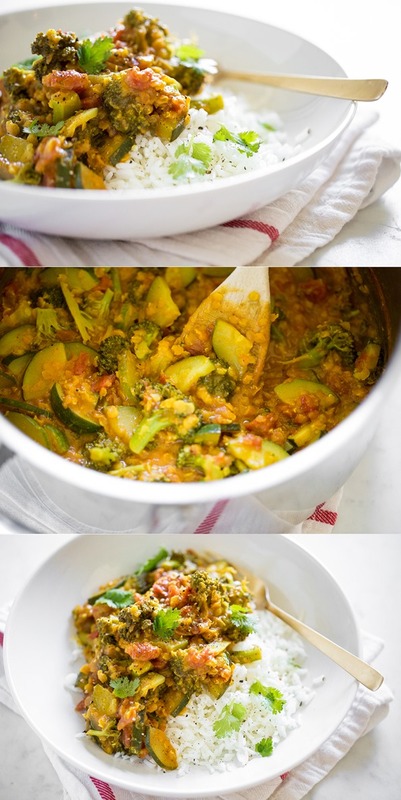 Yummy, healthy & easy :) I love the combination of dal and veggies. Thanks for sharing! Lady, we all go through that with our kids! They go through those phases just to break us down (I swear). At my best, I’m able to make a meal that can be served in pieces to my kids with at least two things I know they’ll eat, but that is still satisfying to my husband and me when it’s all put together. At my worst, I’m preparing four different meals because each child wants something different, my husband gets the main dish, and I prep a version of it that doesn’t include any grain. They do grow out of it, though! My six-year-old is starting to like real food, and it’s delightful. She just fell in love with a soup I made that’s super easy and makes enough to feed us all for a few days. Did you catch that? EASY! Makes a lot! FANTASTIC, I’LL MAKE IT EVERY WEEK, CHILD! Hang in there, mama. You are so totally not alone. Can’t wait to make this! I LOVE your cookbooks and have been a huge fan for the last 3 years. Hang in there with the picky eaters – it is the long game that counts. My boys started to enjoy “our food” around age 4, and are now 8 and 10 and eat everything we eat – just keep offering the food that you make for yourselves, and you’ll be surprised – one day they’ll say they hate mushrooms and the next day they will love them. Question – would you be interested in developing recipes for the slow cooker? With school-age kids the slow cooker is SO helpful because during that late afternoon time/early evening time, it gets SO busy. I never used my slow cooker much until my kids went to school and now I realize how helpful it is! I’d love to see some new recipes, or even older OSG ones adapted for the slow cooker! Thanks for this new recipe, looks so good! Hey Jenny, Thanks for the encouragement!! I’m sure if we keep at it, one day it’ll all click. ;) Thanks for the slow cooker suggestion too. I will have to get brainstorming this fall! I love the idea of developing vegan slow-cooked recipes! I’m living in a house with a lot of meat roasting pans, which are useless for me as a life-long vegan. That said, there is a slow cooker in the back of the cupboard. Last autumn I made a lot of apple butter in the slow cooker, however, found I didn’t end of using it as a spread because I always put nut of seed butters on bread for my son, but I recommend making slow cooker apple butter if you do use jam. Thus, this autumn I’m not making any slow cooker apple butter, just lots (and I mean lots!) of apple sauce from two abundance trees. One use for the slow cooker, that I adore is steel cut oat porridge. That said, if you come up with any savoury slow cooker recipes, I’d be delighted to hear! it was very good!! tanks! 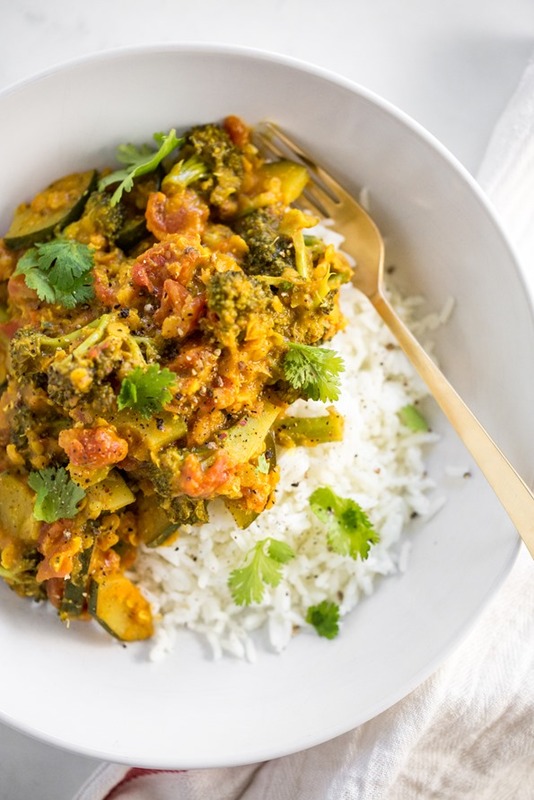 Very informative and looks delicious.I love the combination of veggies and dal.I am definitely trying this.Thank you for sharing. Made this tonight and it was wonderful! Only problem was I thought “8 minute” meant the length of cooking time but oh well it was worth the 20 minute wait to eat! Very flavorful! I have made this twice in the last 2 weeks. It is so good and so easy. And was a hit with a friend. Thank you. I just made this. I am a big fan of your recipes and you have always gotten the seasoning just right. This is a great recipe but I think it needs more spice. I doubled the curry and then added that doubled amount in cumin. That pretty much did the trick. I followed the recipe exactly using broccoli and zucchini as you did and this was pretty much the perfect recipe. Absolutely delicious and very easy!! I followed your advice too, and got the Simply Organic curry powder. Thank you! Oops – I forgot to leave a rating in my comment- 5 stars! This is quickly made and soooo delicious! I love curry so when I took a bit of the meal to see if the seasoning was good I was so amazed! Thanks so much for deciding to make recipes as your living! Looks delicious! I love Dahl in general, and though I used to love my time in the kitchen, having two under two of my own means I’m beginning to fall in love with fast… this is going to be added to our weekly dinner lineup, I just feel it! Awesome! I am always looking for ways to use up things I am not sure what to do with. This seems like the perfect recipe for those times when you look in the fridge and you’re just not sure what you can make with what you have. Seems like veggies could easily be interchangeable, along with fresh tomatoes for canned or even salsa in a pinch. Thanks for the glowing review, Molly! So pleased to hear the recipe was a hit. So glad you enjoyed it, Natalie! THIS IS SO GOOD! I have made so many before and this is my favorite and I love it even more because it was so simple! Thank you so much! I’m glad this recipe was such a hit, Lauren! I love how fast & simple it is, too–so key in our house these days! Hi! Tried this tonight and loved it! However my husband thinks it needed more heat. What spice would you recommend adding? Or just adding more curry powder? Thanks! I made it with Green Beans and Zucchini. The deliciousness of this cannot be undersold. Wonderful dinner tonight. Thanks! You can also certainly make rice or quinoa in big batches and just freeze flat in a ziplock. Makes it easy to thaw quickly, and just reheat in the microwave. I remember my sister had a very picky phase when very young and my mom never made a seperate different dish but she would keep components seperate. So for something like this dish my sister would have just had some buttered rice. She grew out of it and became a vegetarian like i did while still in elementary school and both of us ate more variety than ever before. (Our parents are dedicated omnivores, i started cooking very young ). This looks great. I hope you will do more quick dinner recipes! I’ve got a 3 year old and also work PT outside the home so I don’t have tons of time to cook. Just made this last night for dinner. I added broccoli, cauliflower, carrots, zucchini and mushrooms. I added a little extra water so it was a bit thinner and served with quinoa. It was delicious! Thanks as always for the great recipes! Looks ridiculously good. Absolutely love curry. I am going to try adding some extra kick to it with sriracha or red peppers. Oh, I’d love to hear how those additions turn out, Grant! I think they’d add a great kick of extra flavour. Hi Olya, Are you referring to my skin care page? If so, you can find it here. Hope that helps! Yes, this is it, thank you very much! Yum, this was amazing. I can’t believe how quick and easy it was to do and yet so delicious. I was able to put this dinner on the table even on a night that I was exhausted from work. Look tasty and the best thing is that it does not require much time to prepare :) love it! Can you freeze any leftovers? I would like to make a double batch for quick meals in the future. Looks tasty – will make this tomorrow!! I would love for you to do a cookbook with fastest of fast recipes (please, please, please!). I find it so hard to find the time to cook recipes with my toddler going crazy because I’m giving something attention other than her. I can only imagine what it’s like to cook with a baby thrown in the mix too! I’ve made this twice in two weeks. It’s wonderful. This time, I doubled everything, since the first time I was upset about the lack of leftovers. Perfect. Leftovers are always a great plan ;) Glad you enjoyed the recipe, Sam! I’m so happy to hear that it was a hit. :) Thanks for your feedback! My children have always been fussy eaters. It’s taken years to yet them even close to normal eating habits! I love the idea of 10 minutes prep. This recipe looks delicious. It’s exactly what I like for a quick mid-week dinner. I’m going to make it next. Can’t believe prep time is only 8 minutes! I’d definitely try this. Thanks for sharing! I hope you enjoy it Freya! Tbat is nothing like a daal… daal is JUST lentils or legumes. Love this! I’m always looking for ways to spend more time with my family and quick dinners is what I’m all about! Plus, its healthy! Yippy! Health and nutrition is so important! I know I feel better since I started a new nutrition system :) Energy for days! Hi Angela, just wondering why you use onion and garlic powders ? I always use fresh and don’t have this in my cupboard, is it for concentrated flavour or convenience, can I just throw in fresh ? Really enjoy your recipes, I’m a vegan fringe dweller! This is a wonderful recipe. Would you be able to provide the nutritional information for it? Hi Alana, I’m sorry, I don’t have the nutritional info on hand. But there are some great free online tools (like caloriecount.com or nutritiondata.com) that you can use to calculate the numbers you’d like to know. I hope that helps! I am allergic to coconut oil, what do you recommend in place of it? I don’t really like the taste of olive oil… Thanks! And I love your recipes! I am switching over to plant based and your website is my go to for good, delicious foods! Thanks for the love, Shiela! If you’re not a fan of olive oil, you could try grapeseed oil or refined avocado oil in this recipe–both are on the neutral/light-tasting side, and you should barely notice they’re there. Hope this helps! The PRINT button isn’t working for this recipe. Could you please let me know when it’s fixed? Sounds yummy!!! I was so excited to see this recipe. It turned out well but just a bit too runny, I would cut back on the coconut milk next time and didn’t use any water. I would add more red lentils too and wait to put the broccolli later as it came out a bit too soft compared to the cauliflower and courgettes I used. I just made this last night and it was delicious! I love all the spices and the squeeze of lime at the end brightened up the flavors. Will make this again for sure! Might try adding chickpeas to the veggies, too! Happy to hear you enjoyed the recipe, Emily! Please let me know how you like it with chickpeas–that sounds like a great addition. Looks delicious – dal has always been a staple of mine! And the best part is the ‘pantry’ part as you can put different ingredients in depending on what you have on stock! Oh my goodness this was so delicious that I had to come out to leave a review. I have been searching for the perfect curry recipe and have made quite a few. This is by far the best and easiest. I used cauliflower, broccoli, and potatoes. I also used full fat coconut milk, since that was all I had on hand. I served it over basmati rice and there were no leftovers. I will be making this quite often. Thank you for your delicious recipes! Thanks for this quick and easy recipe. 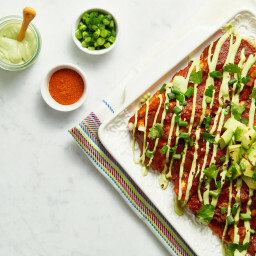 I’ve shared the link with my FB group “Super Quick Plant Based Recipes” https://www.facebook.com/SuperQuickPBRecipes/ I think they will love it AND your site! This is now our weekday lunch meal. I like to make a big batch of something on the weekend and a double recipe of this is absolutely perfect. Thank you so much for all your posts. About a year ago I decided to end an over decade long battle with hormone related issues that left me sick so often it was unbelievable. I’d lost part of my reporductive organs to a cyst, had persistent PCOS on my remaining ovary, had multiple fibroids and even when I tried to “eat healthy” and exercise, couldn’t lose a pound to save my life. I was in and out of the doctors office every other week doing tests, undergoing procedures, my PMS left me nearly bedridden at least a week to 9 days of the month…it really was just not a great quality of life…so after ANOTHER biopsy that turned into an infection that they couldn’t get a handle on, while I laid on my couch an emotional MESS I watched EVERY food documentary on Netflix and realized I need to try something else. So I took a few weeks to do a lot of research and really prepare myself and then started a hypoallergenic diet trial – completely clean for 4 weeks and then reintoduce foods a bit at a time and what became apparent was that “food” that has hormones or chemicals or is processed beyond recognition causes my hormones to go crazy! At first I just made vegetable soups and rice and lentils and ate a lot of fruit because to be honest, I’ve never been a huge vegetable fan so I had NO IDEA how to cook with them beyond the basics, so it was going to be hard to maintain…but I couldn’t argue with the results; after a week I felt great, I started exercising all the time without having to force myself, I lost nearly 20 lbs in 12 weeks, while eating all the time and never feeling hungry…I knew I couldn’t maintain it on bland, no idea what I’m doing food though. (I am a cheese and white bread and meat lover by nature!) Without your blog, and then your second cookbook, and your shoutouts to other blogs I would never have been able to maintain any of this. I am far from perfect but day to day, I eat better and feel better than I ever have in my life and recipes like this one, that make it so much less overwhelming and seem so much more simple are a huge part of why I have been able to do that. So grateful for all the trial and error you’ve probably had to do to be able to help other people, who couldn’t do that themselves. Keep it up, it’s so life changing! You are making me hungry! Great idea for those get it on the table so your kid can go to bed nights! I found this at just the right moment! I was looking for inspiration for tonight’s dinner and here it is. Can’t wait to try this! Hope it hits the spot, Amy! I didn’t read all 150 comments so I’m sorry if this has already been addressed, but I’m not really a fan of yellow curry. Would using a green curry paste work? It looks awesome. Made this tonight and it was so delicious! Thanks a lot Angela for being the pioneer of healthy and quick recipes for all the moms out there ;-) I have two little ones – they both ate some! Thanks so much for the warm words, Debbie. I’m so happy to hear this was a hit with your little ones! Delicious dish! The leftovers were even better! Heaven in a bowl! Thank you!! Have you tried cooking with the kids instead of leaving them under foot? My almost one year old is already obsessed with trying to help in the kitchen. He mostly just moves chopped veggies from one place to another (and samples them along the way). We are ikea hacking him a learning tower so he can be at the counter while I cook. There isn’t much information on what kinds of things he will be able to help with next, but I’m excited to figure it out! Hey Jessica, haha so cute. Adriana also loves to help us cook! Smoothies, pancakes, meal prep…anything where she can stick things into a bag and pour it all over the place basically…lol. I take solace in the fact that one day she will be my personal chef? ;) I’ll have to look up this IKEA hack! Thank you so much for sharing this wonderful recipe! I discovered it earlier this week on your app and I am making it for a second time tonight for dinner! It is so simple to make and the ingredients (as the name suggests) are things that I pretty much always have in the house!! I know this will be a recipe I go back to again and again! I made this this weekend and everybody loved it! I made this today bc I had leftover fresh veggies to use up – broccoli, cauliflower and red pepper. Even tho I had fresh I followed the recipe and used garlic powder and dried minced onions since it’s the first time I’ve made thisi. Now I’m just waiting for dinner time to dig in and can’t wait!! This is so tasty!! My hubby tasted and now he wants some too. Less for me, so sad. I’m new to vegan cooking and trying for health reasons. I’m pretty healthy but getting older and my cholesterol is creeping up. My husband is already taking a statin. So I’d really like to lower that LDL naturally. The trouble is finding decent recipes (I’ve tossed a few disgusting meals) so I’m very happy to find this site. I’m looking forward to checking out more of your recipes online and in your cookbook. Thank you Angela! Thank you so much for your kind words about my blog + recipes! I’m so happy this recipe was a hit for you and your husband. We make it a few times a month…it’s just so easy! I like to make double batches because the leftovers only get better. Happy cooking! Hi Angela – I have read your blog for a few years now and just recently downloaded your APP. I LOVE your recipes and just recently tried this one. It was really good! I used butternut squash and zucchini and I will definitely be making this recipe again! Thank you! Thanks for downloading the app! I hope you love it. And I’m so happy this recipe was a hit. We make it a few times a month! So easy and the leftovers get better the next day. Delicious! I’m going to try a new recipe at least 4 days per week. Making your Vegan BB now. Kitchen smells pretty amazing! I made this last night and–YUM–it was a huge hit. Even my picky, non-veg boyfriend loved it. This will definitely be our new end-of–the-week staple for using up leftover vegetables. Thank you! Hey Rebekah, Great news! Thanks for letting me know. I too love to throw in anything lurking in my crisper…hasn’t failed me yet. haha. We enjoyed this (perfect for a busy school night), and also your chili. Finally, the weather here is cool enough to appreciate these ‘warming’ dishes. Oh, and also made your Pumpkin Chocolate Chip squares last night; pumpkin spice latte is the next up. I’m anxiously awaiting for our fall weather to arrive too..we’re in a big heat wave the past couple weeks! I’m just yearning for 20C highs…hhaa. Those recipes sound like perfect ones to welcome fall with. :) Glad you enjoyed them! I’ve made this recipe 4 or 5 times since it was posted, with several different vegetable combinations. I have to say that potatoe, pea and Swiss chard / kale is my favourite combination. This has quickly become my fall back recipe for dinner as it uses items always in my pantry. I also have divided it into meal type portions and frozen it for work lunchs – so good!! Definitely recommend!! 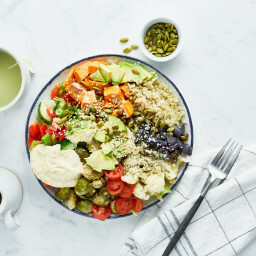 I just came across this recipe and I want to make it soon I was just wondering what looks like quinoa in the picture? Hey Chantal, Is that by chance the ground black pepper on top that I used? Otherwise, I paired the dish with rice on the base. Hope this helps! Hi Angela!!! I am SOOO thankful I found your blog. Made the chickpea salad this past weekend and it was a hit with everyone! my son is allergic to dairy and eggs so he was basically born vegan. And get this….. he is also named Arlo and my husband is also named Eric!!! 😂👯👯 I think it was meant to be that I found your blog. Trying this recipe for tonight’s dinner!! Thanks so much!! Hey ! Love the recipe ! It’s for 1 person right ? Loved it! Used Vindaloo curry powder and regular coconut milk. Thanks Jeff! So happy you enjoyed it. I still love the idea of this recipe in warmer weather. I was just thinking about using lentils this morning so this recipe is really good timing. It looks delicious. Hi! Can you do any recipes with strong black seed oil? I have heard it is great for allergies and I have been making a tea with it and it has helped a lot. But I was wondering could it be used in different recipes? And when used in recipes does it still maintain its anti-inflammatory and analgesic properties? Hey Jennifer, Interesting! I haven’t heard of this before, but I will definitely have to check it out. Thanks for sharing. i made this and used your enchilada sauce instead of tomato sauce because that was all me had. hubby & daughter both enjoyed. we added some miyokos (spelling?) cheese on top (not for baby) and i omitted a few things and changed one or two- but kept the majority. Nothing better than a simple recipe with toddlers because who has time to cook? I just finished making this and the only changes I made were sautéing 1/2 diced onion in place of the onion powder and I reduced the garlic powder to 1tsp. I felt like even that amount of garlic powder overpowered the curry, so next time I will probably try fresh minced garlic. My spices are from Penzeys and their garlic powder is stronger than most, so others may not have that problem. This recipe is a keeper! I made it again today- usually just add whatever I have but I really like the potatoe and carrot :) today accompanied by broccoli and a little bit of parsnip- as always delicious!Thank you for this recipe! I made this tonight and doubled the recipe and I used sweet potatoe, broccoli and a few carrots. I didn’t have a good curry so I made my own following the recipe and it was Delicious! It was comforting and warm!! Because I doubled recipe , I also doubled the liquids but I found it a bit watery- I cooked it with the lid on because I used sweet potatoe but not sure if I should cut back a little liquid next time . It was still amazing and I can’t wait to make it again! Hey Alyssa, Oh homemade curry sounds like a fantastic addition! I’ve found certain combos can be more watery than others; often cooking with the lid off (and just a bit longer than usual) does the trick. Leftovers will also thicken up in the fridge. So happy you love it so much! It’s on an almost weekly rotation over here. This looks so good ! I am such a fan of dal… I will definitely try it :) . This was so easy and delicious. My family of 4 gobbled it up…I’m wondering about making a larger portion next time – would you just double it? Or could I add another 1/2 cup of lentils and another cup of water?? I used red bells & sweet potatoes- quick, easy & tasty! Wow – great – love that you can have all to hand, and make this when you need dinner quick! And it’s still healthy! My kids love this too!!! So happy to hear this one is a hit with your whole family Bec! We make it weekly….I love that I have the ingredients on hand usually too, and I’ve tried a lot of different veggie combos with success. Yes girl! Love me some quick and easy recipes like this on those busy nights. Thanks so much for sharing :) Definitely going to pin this one to make later!! Hope you enjoy it Maria! Another great recipe!!! I have yet to be steered the wrong by your recipes. I truly love that you make vegetarian/vegan food soo flavorful. Thank you!! That means the world to me…thank you so much for your encouragement! Hey Christine, I’m so happy your whole family loved it. I agree about the quick prep time..it’s so nice! And it works with a bunch of different veggies. I’ve been making it once a week now that the cool weather is here to stay. 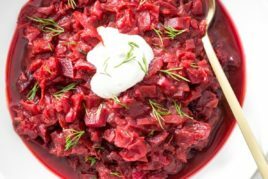 Hi there — is there much difference between brown lentils and red ones, in terms of this recipe? Thanks! Hey Sahari, I haven’t tried it with brown lentils but I can’t see why it wouldn’t work! If you try anything please let me know how it goes. Hi there, I tried this recipe out last night and it was very soupy and had way too much liquid. Any ideas? I did double the recipe but I doubled all the ingredients, including the lentils. Hey Natalie, I’ve found it can be more liquidy when doubling this recipe, so I tend to cut back on the liquids a bit when doubling it. It also depends on the veggies you use (veggies like zucchini will release a lot of water). It also dos thicken as it sits overnight so you may find that it’s not a soupy after sitting for a bit. Hope this helps! 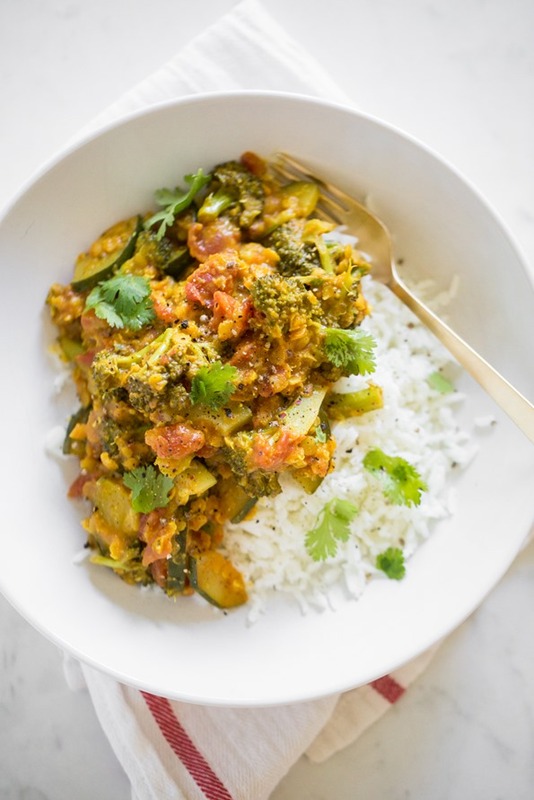 I seriously could not believe how delicious this was because it was so much simpler than any curry recipe I had ever made before and tasted way more flavorful. Love that it’s quick and flexible so I can just throw in whatever veggies I have at the moment! Delicious! So simple, so flavorful, so flexible! Loved it. There are a couple of us in the house who are sick of dal, but this was such a creative and healthy twist. Loved the vegetable-to-dal ratio too (vs just all dal and a little vegetable). 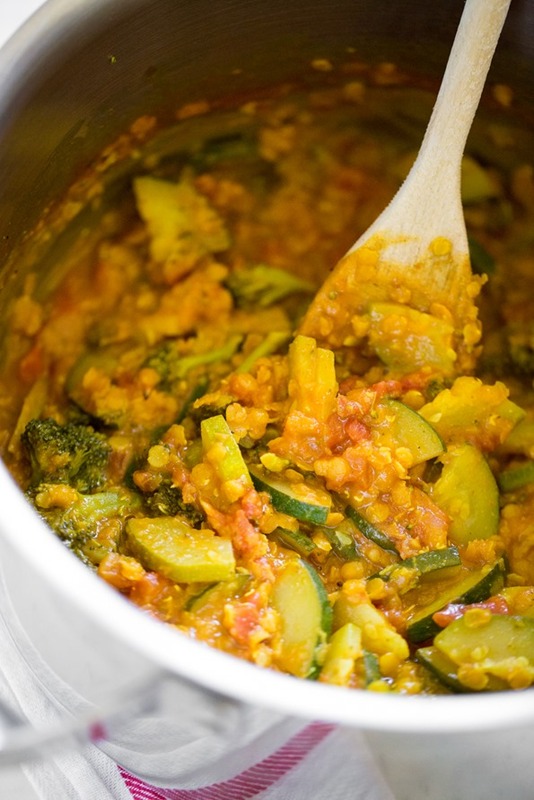 I didn’t have red lentils so used the green ones from the supermarket—worked great. THANK YOU!!! Oh so good to know about the green lentils working great. I will try that next time. Glad this one was a hit for you and the fam! Forgot to ask—why is it called pantry dal “two ways”? What’s the second way? 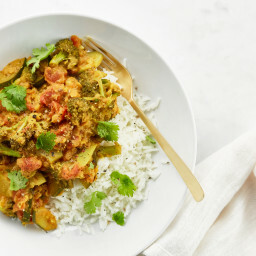 (In the tips): If you don’t have a favourite curry powder blend on hand, you can substitute the following: 1 1/2 teaspoons ground turmeric, 1 1/2 teaspoons ground coriander, 1 teaspoon ground cumin, 1/2 teaspoon ground ginger (or more to taste), and 1/4 teaspoon cayenne pepper (optional). Don’t forget to use the 1 1/2 teaspoons of both garlic powder and minced onion, as well. Hi! I am in love with this delicious dish and it is on regular rotation in our house. I’m starting to think about Passover, which for many jews does not permit any beans, lentils, chickpeas, soy etc. Do you think I could make this without the lentils? Hey Andrea, I think you probably could with a bit of adjustment! :) I would suggest reducing the liquid a bit, and you may want to add in another veggie to give it a bit of thickness. Thank you! I will give that a try. Has anyone made this ahead of time and reheated it? Recommendations for doing so?? Hey Jennifer, I reheat the leftovers in a pot on the stovetop…works great! This is delicious! I was shocked because it was so easy to make. Wow! Lovely! Would not have thought lentils could cook that fast (18 minutes) and uncovered. Made it tonight with carrots, zucchini, and bell peppers. Doubled the recipe but with one can of water plus the can of coconut milk. Hey Jasmine, Thank you so much for the feedback! I love to double the recipe as well…otherwise it goes so fast. Enjoy the leftovers! Such a great combo!! Thanks for the recipe review…I’m so happy you love it. This recipe is pure genius! I have made it multiple times since it came out with different veggie combos. I even made it for myself on a yoga retreat, and it was perfect sustenance! I’d like to see more quick and easy entrees like this! Thanks so much Amber! So glad it’s been a hit…I love changing it up too (actually I do so almost every time!). I just made this for my lunch, since I had all the ingredients on hand. I love how adaptable it is! I used broccoli and sweet potatoes as my veggies, and then added a can of chickpeas as it sounded good. And it certainly was good! Hi! Love all your recipes and you’ve helped this vegan be able to cook meals my carnivore husband and a toddler can all eat and enjoy, which is no easy feat! Just wondering, do you think this recipe could be thrown into a slow cooker and left on low? Hey there, Aww thanks for the kind words…I’m so glad to hear that! I haven’t tried it, but I do think you could make this in a slow cooker. If using onion or garlic as party of your 4 cups of veggies, I would saute those first, but other than that I think you could dump it all in. I’d love to hear how it goes if you try it! I will be doing so soon. I thought this was an IP recipe but in the instructions it doesn’t give instant pot directions, it’s stove top. Amy I missing something? Also, could I use canned lentils? How do I adjust cooking? Hey Amy, Oh you must’ve seen my stories this week? I just got the IP this past weekend so I was playing around with this recipe in the IP. I do hope to share it once I get it perfect! Right now it looks like this dal worked well at 5 minutes high pressure with instant release. I used 2 cups cubed butternut squash and 2 cups chopped cauliflower and it was an amazing combo. I’d love to hear what you think if you try it out! I absolutely love this recipe! I make it a few times a month. Yesterday I had a crazy schedule with kids and activities and wasn’t going to get home until late. I dumped everything in the crockpot, stirred it up, and set it on low for 6 hours. It turned out great! I used 2 cups potatoes, 1 cup broccoli, and 1 cup cauliflower. Just before serving, I added a few handfuls of baby spinach and stirred until wilted. It probably didn’t need the full 6 hours – we could have eaten it around the 4 or 5 hour mark (or could have set on high for 2-3 hours). Hey Kim, I’m so glad the pantry dal is a hit with your fam! We must have it a few times a week over here too. Thanks for sharing your crockpot method…that sounds awesome. I was craving a good veggie curry and this really hit the spot! I used broccoli and zucchini for my veg as I happened to have exactly 2 cups of each on hand and a can of Trader Joe’s regular, not light, coconut milk. Also subbed half a small onion, finely chopped for the onion flakes. So easy to throw together (I honestly dont think it even took a full 8 mins of prep!) And fantastic flavor! I can’t wait to dig in to the leftovers tomorrow. This is one of those back pocket meals that are easy to get on the table. Will definitely be making it again. Thanks! Hey Stephanie, oh I’m so happy you loved the curry! I’ve been craving all the cozy curry dishes lately (hello, fall! ), and this one is a staple in our weeknight rotation too. :) Thanks for sharing your swaps! Can you tell me how I’d make this in my instant pot? This is one of my favorite recipes–so delicious and so fast and love the flexibility of using any veggies. Would love to see an instant pot version. Hey Jen, An IP version is a great idea! Thanks for your review…so glad you love this one. I love this recipe and have made it multiple times! I want to try it with peas and carrots tonight, but I only have frozen peas. After thawing, would I add them to the pot at the same time as the carrots? Or should I add them toward the end of the cooking process? I made this tonight. It was delicious! Thank you! This has quickly become one of my go-to vegan recipes not only for its simplicity but delicoious flavour. Each time I make it I use different combinations and types of vegetables and it always comes out perfectly. This is a real keeper. Delicious! I doubled the recipe, and used one bag of frozen broccoli and one bag of frozen broccoli Normandy mix. I may try cooking it in a slow cooker next time. (Maybe those with instant pots can make this in there too.) Basically, this was the best no-prep recipe I’ve ever made. Thanks! So good! Didn’t use tomatoes instead added some V8 juice – cut recipe in half. For us non vegans some ground turkey is great addition! I made this recipe today, and it was my very first Oh She Glows recipe despite following your blog for a while. For some reason, I have always found plant-based food a little intimidating. This was really delicious and a total cinch. 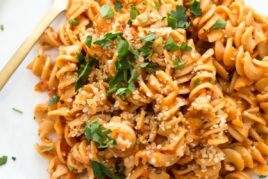 I especially loved not having to brown onions and garlic – great use of pantry ingredients and an awesome time saver. I didn’t serve it on rice, just a big bowl with cilantro. Total yum! Hey Sarah, So glad you loved your first OSG recipe! :) Thanks so much for letting us know how it went.